With the exceptionally warm weather we are experiencing now in the northeast, I decided to take a trip to Little York to see if any plants were blooming. While the spring ephemerals are still at least a few weeks from flowering I did find Daphne and Speckled Alder in full bloom. 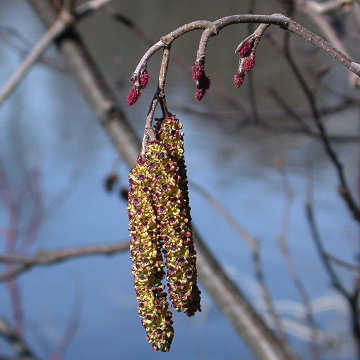 The male flowers are in the larger catkins, while the female flowers are in the short reddish ones. Daphne has more showy blooms, with 4 magenta petal-like sepals and a light fragrance. 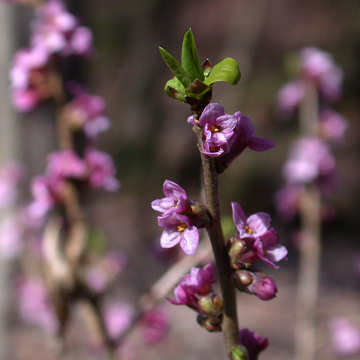 While the speckled alder is a native wetland shrub, Daphne mezereum is native to Europe and parts of Asia. It can be found in some of our rich woodlands, often along trails. The flowers are followed by bright red fruit in May or June. Not much else was flowering, however the maples and aspens appear to be flowering on the hillsides a few weeks earlier than I’ve seen in previous years.